Mahmood comes into this fight looking lean and mean, he has clearly been working serious amounts of cardio but it turns out that he didn’t need it. Ligato comes out fast looking for the takedown, for which Mahmood defends easily before slipping the inside leg in and jumping up on his back, he proceeds to add the other hook and sticks limpet like to his back working for the rear naked choke. Sensing he is in trouble Ligato slams down onto his back with vicious force but Mahmood is relentless getting the tap at the 0:37 mark. Easy fight for Mahmood, Ligato just couldn’t handle the pace in which he operated. Ewin looks much larger than McCauley build wise and his strength level is on another scale to the Sambo fighter. Following the bell, they circled a little before Ewin feigned and shot in for the double leg driving his opponent hard into the cage, once down he secured position and held it tight, in desperation to get out he rolled and gave his back; it didn’t take long for Ewin to sink the choke in for the tap at the 1:55 mark. Ewin looked solid, calm and dominant whereas McCauley looked surprisingly endangered on the ground for a Sambo player. The general consensus coming into this fight was that Mason would have a size advantage against the Frenchman as he had to cut 8kg to make weight. Llaudin by contrast was at walk around weight all weekend. Come fight time they were surprisingly equal. The round starts with both fighters exchanging leg kicks, Llaudin lands a good kick and shoots for the double putting Mason on his back and driving to the cage where he proceeds to land body shots. Mason eventually manages to find a way out using strength to elevate but Llaudin has an over/under and prevents him from escaping; Mason drives him down into guard. Sensing that the ground isn’t necessarily where the key to the win is he backs out prompting the ref to call open guard. Mason comes over with a beautiful axe kick that misses its mark, always slick, Llaudin wastes no time in securing the appendage and proceeds to setup the inside heel hook. The key to this submission was in the setup, Llaudin leg Triangled Mason in the process of the setup, but managed to secure Mason’s left hand in there as well giving him no leverage point to counter, and Mason had little choice but to tap at the 2:55 mark. It appears that Alex Reid is unable to have a fight without controversy. He came into this match looking to trade cleanly, press the action and get the win – he needs it. So the first round starts with Pokam coming off better in the exchanges, mainly landing knees when Reid presses forward as well as occasional flying knees. Reid has a good chin on him but it didn’t stop him getting thumbed in the eye by accident in the opening minutes of the round. A brief doctor’s check and they resume; Reid is landing occasional punches and kicks but he is leaving his hands quite low on occasion and this allows Pokam to secure the clinch where he appears to work the knees better. The round ends with Reid looking bloody but still game, his left eye a little swollen from the poke but generally ok. Round two runs a different route, Reid appears to find his range and starts landing the cleaner shots rocking Pokam on two occasions, he is still getting tagged on the occasional counter but he is faring much better, Pokam appears to become quite gassed in the exchange, what happens next is unfortunate but brutal – Reid takes a huge thumb to the eye making him scream out in pain and drop down to the floor in agony. Pokam is sent to a neutral corner during the doctor’s inspection during which time I manage to catch a photo of his thumb coated in blood, I am sure it was unintentional but nevertheless it halted the bout. Reid looks like he has been through a meat-grinder and has no depth of field in his vision, he cannot continue. A judge’s decision is called for, but evoking more controversy the fight is ruled in favour of Pokam, there are rumblings of the fight being scored only on the first round but whatever the case, the fight needs to happen again. From my own personal opinion, I think Reid needs to take 6 months off, rest, heal and re-energise himself before fighting again against Pokam. Both fighters look tentative in the early part of the round, Murdoch is clearly the better puncher of the two landing some combos but not really letting go with full steam; Legeno for his part has appeared to add some seriously heavy kicks to his arsenal – something we haven’t seen from him so far, he is gamely chopping away at Murdoch’s legs, keeping the smaller fighter outside of the pocket. Sure, they don’t have the snappiness of Daley’s kicks but they are proving effective. Murdoch lands a good right hook opening an inch long cut under Legeno’s left eye, he then begins to target the cut but Legeno lands a good hook of his own forcing Murdoch to close the distance, Legeno hip throws him down and proceeds to mount. A few strikes later Murdoch gives up his back and Legeno sinks the rear naked choke in. Murdoch battles to his feet with Legeno in tow but succumbs at the 4:10 mark. I must say that this fight didn’t play out quite like I had expected it to, Cherman is highly regarded but I just thought Silva would be too much for him, on paper his experience level and style suggest as much but in reality he dominated Silva through superior BJJ putting a grappling masterclass on during the first two rounds of the bout. Silva had no answer to the positioning Cherman was able to achieve but it has to be noted that his submission defence is excellent, I counted Cherman locking on a triangle, a body triangle with rear naked choke, a head and neck choke and an Armbar – Silva escaped all of these. Everytime they rose their feet it became apparent that Cherman wanted none of the exchange and pursued the takedown relentlessly. Having lost two rounds in the eyes of the judges Silva went for broke slapping on an Armbar that caused his compatriots arm to break at the elbow. 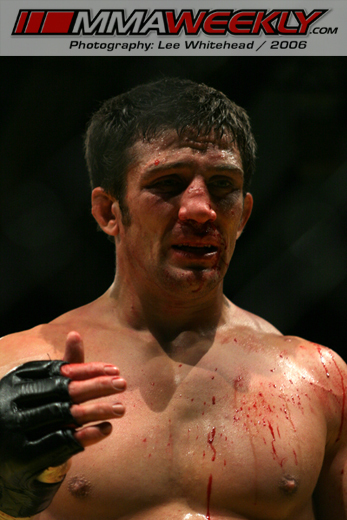 Unrelenting, he continued the last four minutes of the round with a broken arm, still able to work of the top position stacking Silva into the cage. At the end of the bout Silva looked devastated, he had effectively won that fight with the Armbar and had the referee spotted the break it would have been stopped, as such given the way it played out Cherman won via decision and although it was a 100% correct – you have to wonder if Grant’s vantage point would have been different it would have been stopped. Nakamura vs. Shaolin was stopped for a break, in this instance it was masked by the Armbar being inverted and thus concealed by Silva’s own body. In a similar vein to Cherman earlier, Azeredo relied on his speed and explosiveness to put on a solid jujitsu match against the rising star that is Paul Daley. 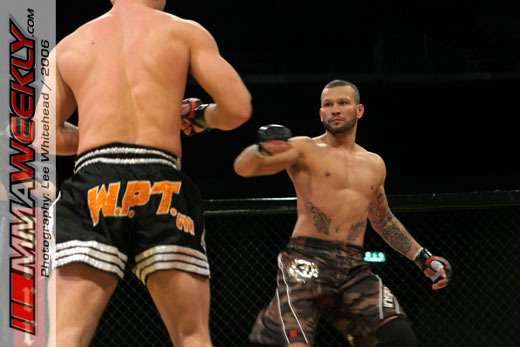 From the offset we knew Daley was going to be headhunting and he hit the Brazilian with some vicious leg kicks throughout, his punches were crisp and tight but he was just unable to put the Brazilian in enough trouble to really tee off save for a brief moment in the third round. 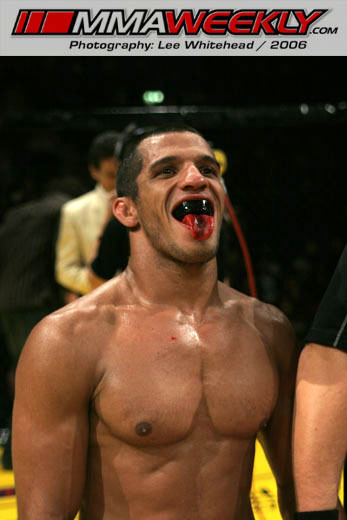 Azeredo is a wild man, taunting his opponent, moving fast and proving quite difficult to hit with anything other than kicks. When ever he shot for a takedown he invariable won it and managed to frustrate Daley throughout the bout. You could sense come the third round a slight desperation in Daley’s attack as he was definitely head-hunting, but it never came, Azeredo came and worked a solid gameplan for the Unanimous decision win. 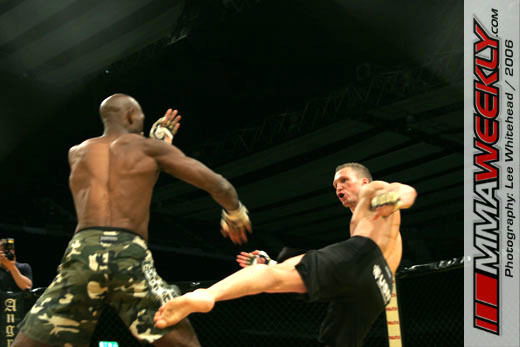 This fight proved that Daley is world class, his stand-up has improved dramatically over the course of 2006 and if his takedown defence was better things might have gone a little more his way. This fight had hallmarks of the typical PRIDE matches between the Japanese and the Brazilians. We have seen it all before, Japanese jujitsu in dodgy swimming trunks against Brazilian Jiu-Jitsu. In this case the stand-up was brief and served only to close the distance. Leon jumped in immediately to stop the fight. Shaolin was never in any real danger and further consolidates his position as one of the very best in the world at Lightweight – why the hell is this guy not over in PRIDE or the UFC amazes me! Sinosic seemed content to stand and strike with Epstein, which came as a surprise considering his stand-up appeared rudimentary and robotic. He clearly had a massive reach advantage but his shots were too telegraphed to make much of an impression on the wild Briton, who managed to return a few shots of his own on the counter opening up a nasty cut under the antipodeans’ right eye. Sinosic landed some good shots on Epstein but there wasn’t much power on them, not enough to put the battle-tested fighter in any trouble, but enough to draw Epstein into thinking it was going to be a standing war, shortly after he closed and secured a spine crush / trip takedown into mount and moved himself up swiftly to go for the Armbar – and what an Armbar is was, beautifully executed and fluid, Sinosic clasped his knees tight with the arm in and rolled to the side exerting massive pressure on his opponents joint. A UK debut with a win 2:35 into the first – Sinosic says he will be back; what awaits Epstein now having dropped two in a row? Boy did I get my prediction wrong for this one! Zelg came out possessed, landed three hellfire kicks to Weir’s legs forcing him to engage, Weir landed a good straight right but Galesic punished him with a lightning quick flurry dropping him to the ground. Wasting no time and sensing blood he stood over the felled champion and hammered him 4 times in the face with precise lethal blows. Perfect fight for Broughton, he mixed things up nicely between low-ankle/shin sweep takedowns, push kicks and outside Thai kicks, come the middle part of the first it was clear that Butterbean was tired (he came in some 30 kilos heavier than his usual weight) and was going to have to rely on a big shot for the win. He had a chance during towards the end of the round landing a good hook on Broughton but it didn’t seem to faze the champ or throw him off his plan. Were some fighters in this division advance on strength or KO power, Broughton wins out on smarts; he was patient, picked his shots, kept out of range and avoided the counter punching for which Butterbean has earned his crust. The fight hit the ground 3 times during their encounter and at every opportunity Broughton pounded strategically amounting damage. From a marketing point of view someone must have dreamed up the idea of 652lbs of combined man-mass in the cage, and up until Broughton decided to mount it hadn’t become immediately apparent exactly how large an opponent Butterbean was. But suffice to say, I very much doubt anyone will be underestimating Broughton in the future – it’s going to have to take another smart fighter to beat him.